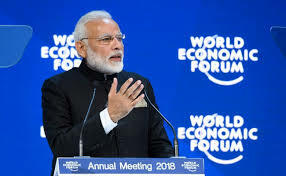 China has hailed Prime Minister Narendra Modi's speech at the plenary session of World Economic Forum in Davos, Switzerland. Chinese Foreign Ministry said Mr Modi's speech reflects the fact that economic globalization is the trend of the times which serves the interests of all countries, especially the developing countries. It said, on the fronts of opposing trade protectionism and advancing economic globalization, China and India share common grounds and common interests. Beijing said they would like to enhance communication and coordination with India and other countries in actively adapting to and steering economic globalization so that it becomes a positive force for the economic growth and the welfare of all countries.Chinese Foreign Ministry described India an important neighbour of China.